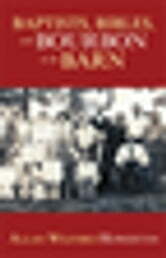 Baptists, Bibles, and Bourbon in the Barn is a spunky memoir about growing up in Western Kentucky during the roaring twenties, the Great Depression, and the run up to World War II. Written from the viewpoint of a kids bottom-up perspective of the fundamentalist Baptist culture of the era, it is a story of preachers shouting fire and brimstone, a cow-sow-hen economy of unpainted barns and farmhouses, kerosene lamps, outhouses, fiddling music, Bourbon whiskey, hordes of relatives, hardship, death, and survival. But it is also a story of love, graced by nostalgia in remembrance of a time that is gone. MORE ON THE WRITING OF BAPTISTS, BIBLES, BOURBON, BARN. From Cave-in Rock, Illinois, where pirates once played havoc with shipping along the Ohio River, one can look across to the rivers south bank in Western Kentucky. There, in the early 1830s, Tapley Howerton, the authors greatgreat-grandfather plunked his family on land along Crooked Creek in what was then Livingston (now Crittenden) County. It was a bum decision. He was soon to suffer a tragic and unexpected fate. It had the effect of trapping his descendents in an economic and cultural backwater, dominated by religious fundamentalists, for several generations. Almost one hundred years later, Allan Wilford Howerton, Tapleys great-great-grandson, was born on a tenant farm not far away in the Tradewater River bottoms of Crittenden County. Not knowing of Tapley until much later in life, he would research his past and produce what eventually became Baptists, Bibles, and Bourbon in the Barn. It is the authors early-life story and a tale of Tapley and his legacy. Books related to Baptists, Bibles, and Bourbon in the Barn: the Stories, the Characters, and the Haunting Places of a West (O'mg) Kentucky Childhood.